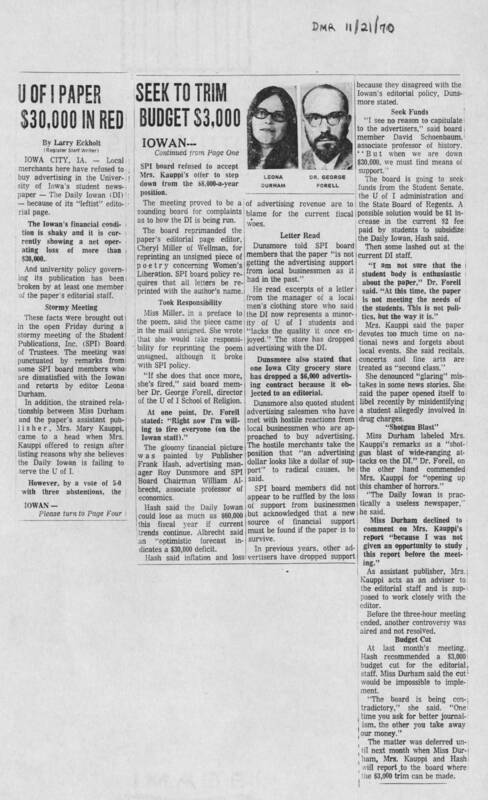 DIY History | Transcribe | Social Justice | Daily Iowan and Leona Durham controversy, 1970-1972 | 1970-11-21 Des Moines Register Article: "U of I Paper $30,000 in Red"
1970-11-21 Des Moines Register Article: "U of I Paper $30,000 in Red"
DMR 11/2/70 U OF I PAPER $30,000 IN RED By Larry Eckholt (Register Staff Writer) IOWA CITY, IA - Local merchants here have refused to buy advertising in the University of Iowa's student newspaper - The Daily Iowan (DI) - because of its "leftist" editorial page. The Iowan's financial condition is shaky and its currently showing a new operating loss of more than $30,000. And university policy governing its publication has been broken by at least one member of the paper's editorial staff. Stormy Meetings These facts were brought out in the open Friday during a stormy meeting of the Student Publications, Inc. (SPI) Board of Trustees, The meeting was punctuated by remarks from some SPI board members who are dissatisfied with the Iowan and retorts by editor Leona Durham. In addition, the strained relationship between Miss Durham and the paper's assistant publisher, Mrs. Mary Kauppi, came to a head when Mrs. Kauppu offered to resign after listing reasons why she believes the Daily Iowan is failing to serve the U of I. However, by a vote of 5-0 with three abstentions, the IOWAN - Please turn to Page Four SEEK TO TRIM BUDGET $3,000 IOWAN -- Continued from Page One SPI board refused to accept Mrs. Kauppi's offer to step down from the $8,000 a year position. The meeting proved to be a sounding board for complaints as to how the DI is being run. The board reprimanded the paper's editorial page editor, Cheryl Miller of Wellman, for reprinting an unsigned piece of poetry concerning Women's Liberation. SPI board policy requires that all letter be reprinted with the author's name. Took Responsibility Miss Miller, in a preface to the poem, said the piece came in the mail unsigned. She wrote that she would take responsibility for reprinting the poem unsigned, although it broke with SPI policy. "If she does that once more, she's fired," said board member Dr. George Forell, director of the U of I School of Religion. At one point, Dr. Forell stated "Right now I'm willing to fire everyone (on the Iowan staff)." The gloomy financial picture was painted by Publisher Frank Hash, advertising manager Roy Dunsmore and SPI Board Chairman William Albrecht, associate professor of economics. Hash said the Daily Iowan could lose as much as $60,000 this fiscal year if current trends continue. Albrecht said an "optimistic forecast indicates a $30,000 deficit. Hash said inflation and loss of advertising revenue are to blame for the current fiscal woes. Letter Read Dunsmore told SPI board members that the paper "is not getting the advertising support from local businessmen as it had in the past." He read excerpts of a letter from the manager of a local men's clothing store who said the DI now represents a minority of U of I students and "lacks the quality it once enjoyed," The store has dropped advertising with the DI. Dunsmore also stated that one Iowa City grocery store has dropped a $6,00 advertising contract because it objected to an editorial . Dunsmore also quoted student advertising salesmen who have met with hostile reactions from local businessmen who are approached to buy advertising. The hostile merchants take the position that "an advertising dollar looks like a dollar of support" to radical causes, he said. SPI board members did not appear to be ruffled by the loss of support from businessmen but acknowledged that a new source of financial support must be found it the paper is to survive. In previous years, other advertisers have dropped support because they disagreed with the Iowan's editorial policy, Dunsmore stated. Seek Funds "I see no reason to capitulate to the advertisers," said board member David Schoenbaum associate professor of history. "But when we are down $30,000, we must find means of support." The board is going to seek funds from the Student Senate the U of I administration and the State Board of Regents. A possible solution would be $1 increase in the current $2 fee paid by students to subsidize the Daily Iowan, Hash said. Then some lashed out at the current DI staff. " I am not sure that the student body is enthusiastic about the paper," Dr. Forell said. "At this time, the paper is not meeting the needs of the students. This is not politics, but the way it is." Mrs. Kauppi said the paper devotes too much time on national news and forgets about local events. She said recitals, concerts and fine arts are being treated as "second class." She denounced "glaring" mistakes in some news stories. She said the paper opened itself to libel recently by misidentifying a student allegedly involved in drug charges. "Shotgun Blast" Miss Durham labeled Mrs Kauppi's remarks as a "shot gun blast of wide-ranging attacks on the DI." Dr. Forell, on the other hand commended Mrs.Kauppi for "opening up this chamber of horrors." " The Daily Iowan is practically a useless newspaper," he said. Miss Durham declined to comment on Mrs. Kauppi's report "because I was not given an opportunity to study this report before the meeting." As assistant publisher, Mrs. Kauppi acts as an adviser to the editorial staff and is supposed to work closely with the editor. Before the three-hour meeting ended, another controversy was aired and not resolved. Budget Cut At last month's meeting Hash recommended a $3,000 budget cut for the editorial staff. Miss Durham said the cut would be impossible to implement. "The board is being contradictory," she said. "One time you ask for better journalism, the other you take away our money." The matter was deferred until next month when Miss Durham, Mrs. Kauppi and Hash will report to the board where the $3,00 trim can be made.